Fourth Row Center: Film Writings by Jason Bailey: On DVD: "How I Won The War"
Richard Lester's How I Won The War is a film that one approaches with a hope and optimism that slowly falls away over the course of the film's first half hour. 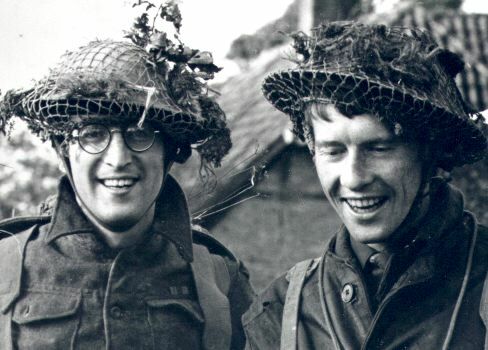 For here is the great, irreverent filmmaker's follow-up to The Knack and his two classic Beatles vehicles A Hard Day's Night and Help!, and it stars John Lennon in his only solo acting role, and it is an anti-war comedy from smack dab in the middle of that subgenre's greatest era (between Dr. Strangelove in 1964 and M*A*S*H in 1970). But the fact of the matter is this: for whatever reason--the 40-plus years since its release, the self-conscious experimentation of that era, the poor travel of its very British sensibility--How I Won The War simply does not work. Though Lennon is second-billed, he is a very minor supporting player; the film is the story of Lt. Ernest Goodbody (Michael Crawford), a inept, jingoistic upper-class twit who leads his WWII company (Third troop, Fourth Musketeers--an amusing coincidence, considering Lester's later tackling of the Dumas stories) through various battles and blunders, getting nearly everyone but himself killed (in spite of his men's best efforts to bump him off). He relates his "memoirs" orally, after he is captured by German troops; he frequently breaks the fourth wall, even referencing the film itself ("Every word of this film is written in pencil... in my own handwriting"), as do several other characters, including Gripweed (Lennon) and Clapper (Roy Kinear, whose natural sense of comedy comes in handy on several occasions). Lester is clearly going for a kind of hazy absurdism, but the execution is lead-footed and unapproachable. Much of his experimentation is just befuddling, and the symbolism is frequently heavy-handed in that very specific, late '60s way that has not aged terribly well. Some of his devices are clever--I liked the cutaway to the two women watching the film in a cinema ("My son went like that"). But most of his little tricks are downright bizarre, and just sort of sit there on the screen. But the bits that work are fleeting; overall, the film is overlong, obvious, and simply not up to the filmmakers' standards. I worried, as one often does with a topical film of this age, whether I was simply too far removed from the film to see it for what it may have well been, at that moment. A trip to the Ebert Archives put my fears to rest. "In How I Won the War," Ebert wrote, in January of 1968, "Lester has indulged his personal style instead of using it. He is its victim, not its master, and it runs away with him. It is impossible to be sure what is meant in this movie." If a critic as smart as Ebert couldn't figure it out then, well, I don't feel quite so bad about not being able to make head or tail of it now. How I Won The War is an interesting failure, worth a glance for Lennon fans and Lester aficionados. However, the hefty $40 price tag (it's currently going for $30 on Amazon) is way too high for a hit-and-miss effort burned to DVD-R, even with the "commemorative photo album" that was not included with our review copy; that must be a helluva book to warrant a Criterion-level MSRP. Interested parties should save their cash and stream it on Netflix instead. "How I Won The War" is available now on DVD. For full A/V and bonus feature details, read this review on DVD Talk.